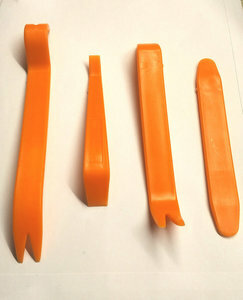 Set of 4 solid plastic removal tools for car interiors. This set is made to remove panels and upholstery from ar interiors with suitable force and unlike screwdrivers won't damage the materials. Used by professional auto installers. The fork models can be used to pop out special fasteners, for the Model S that would be in frunk and carpets in the trunk. All can be used to create space between door/dashboard panels and the car metal they are mounted on using a clip system: they just pop open.